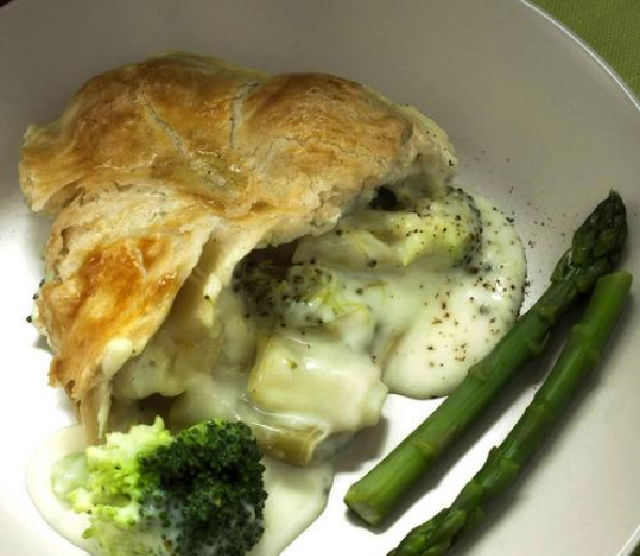 Puff pastry transforms unappetizing left-over vegetables into a brand new dish! Sufficient sauce of your choice to cover the vegetables in the pie dish. You can use any sauce, either home-made or ready-made. A tomato based sauce is good with Mediterranean roasted vegetables, and a cheese sauce is good with leeks and potatoes. Chop the vegetables into bite-sized pieces and put them into a large bowl. (If you want to supplement your left-overs with extra vegetables, it is best to cook them first so that your pie doesn’t contain some vegetables that are firmer than others. Adding a tin of kidney beans or chick peas is another good way to make your left-overs go further, and improves the nutritional profile of the dish). Stir the sauce into the vegetables. Place the pastry sheet on a floured board. Turn the dish you will be using for the pie upside down and press it gently onto the pastry sheet to make a faint impression. Use a sharp knife to cut the shape out of the pastry. You might like to cut some decorative shapes out of the pastry trimmings and decorate the pastry lid, or roll the trimmings into strips, brush them with a little milk or beaten egg, sprinkle them with a little grated cheese and paprika, and bake on a parchment-lined baking sheet at 190°C for 15 minutes to make some quick cheese straws. Transfer the saucy vegetables into your pie dish, carefully place the pastry lid on top and use the tip of a sharp knife to make a couple of air holes so that steam doesn’t build up under the pastry and make the bottom soggy! Bake for about 30 minutes - until the pastry is golden and crisp.